A Configuration is a set of specific menu settings which will be applied to an individual menu instance. If you would like to have multiple UberMenu instances on your site which have different settings (for instance, a different skin, position, orientation, trigger, transition, etc), you’ll need to create a new Configuration. By default, UberMenu comes with a main configuration, called the Main UberMenu Configuration. Its settings are configured in the first tab of the Control Panel. In the box that appears, give your configuration an ID and click the Create Configuration button. One or two words is best, as this ID will be used in your code and shortcodes. The page doesn’t refresh automatically in order to give you a chance to close the box and save any other changes you’ve been working in if you haven’t already. A new tab with your configuration ID will appear in the Control Panel. Click this tab to change the settings for this new Configuration. Integration of the new Configuration works just like the Main Configuration. You can activate this Configuration on a Theme Location to integrate it automatically (don’t activate the same theme location on multiple configurations). You can also use the Widget and set your Configuration in the Widget settings. 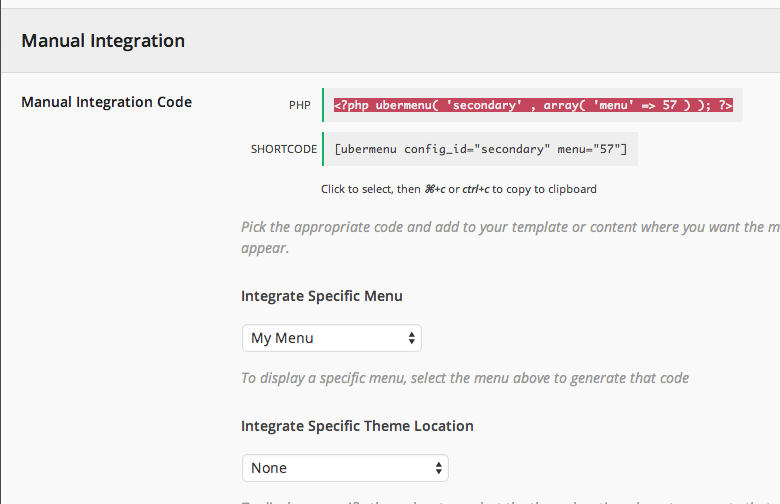 You can also use the Manual Integration code to insert an instance of a specific menu or theme location using this Configuration wherever you like in your theme templates. You can add as many Configurations as you like. To delete a Configuration, click that Configuration’s +Tab, then click the Delete tab in the left panel. 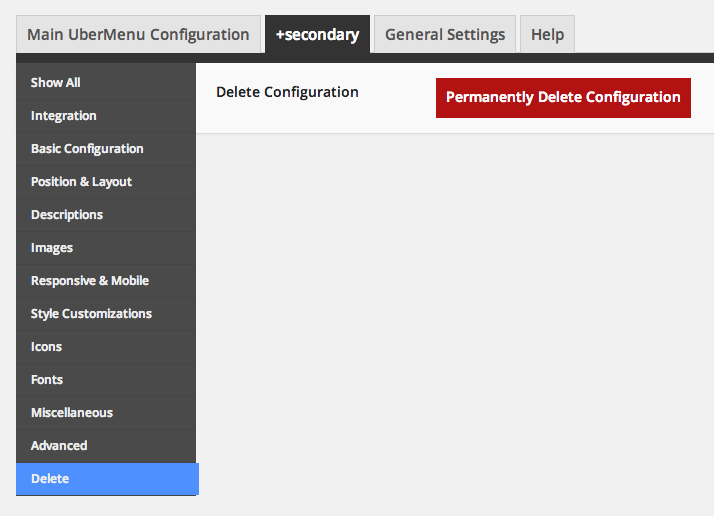 Click the Permanently Delete Configuration button and then confirm the dialog box to delete the Configuration.